We stayed for 6 days in CaribbeanResort 1103. The condo was exactly as described and we could not have been any happier. The view was amazing and the week stay was exactly what we needed to recharge ourselves. We enjoyed the pool and hot tubs, the beach, and the atmosphere of the gulf coast. We would definitely stay in this condo again. Thank you for sharing your condo with us. The staff was incredibly attentive. I cant say enough about them. The only issue we had was the pool heater. We had young kids and even though I had to let Claudia know, she was incredibly responsive and worked hard to make it right. It worked out well. We are so thankful for our time here. So friendly, so nice and accommodating and responded to my texts messages regarding questions and/or Comments almost instantly! We couldnt have been more blessed by having the opportunity to stay here! We felt right at home and had everything we could ever need in this unit and so much more! The owners have truly thought of everything! From the screen door on the sliding doors to the Direct TV, and to the power strips on either side of the master bed for charging phones and devices...we cannot wait to rent this unit again! We WILL be back most definitely ! Wonderful week at Pearl 604! Thank you for the experience. The team was very responsive and provided timely communication regarding all aspects of our stay. Caribbean Resort is clean, well maintained and provides gorgeous gulf and bay front views. The floor to ceiling windows are simply magnificent. It was a totally restful and relaxing vacation. Claudia was very professional and super responsive to our questions/concerns. Outstanding!!! Great unit. However, the white sofa and loveseat are NOT comfortable at all. My wife enjoys furniture that is not firm but this was even too much for her. 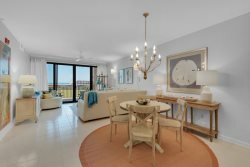 View Property: NB-8257 Gulf Blvd. When we were planning this trip, I had a question about the property and sent an email to the address listed and immediately received a reply. I also appreciated the emails sent with information on how we would know how to access our unit. View Property: 307 Maldonado Dr. The only suggestion I have is another cutting board and a set of deeper mixing bowls. never received some flowers that were sent to us, but rest of experience with all team members was excellent. View Property: 715 Maldonado Dr.
See comments on 1000 and 913 Ariola surveys. Beautiful Home! The view, the house itself, the backyard...all of it was perfect for our small beach wedding! Had to call for a hiccup with the elevator and it was handled the next day. Also, we arrived a little early and were allowed early access to home. It was amazing! The property was so beautiful. A short walk to the beach. The views were amazing. Especially from the top floor. Its a well cared for property. Everything in working order. Our group loved it! Everything beautiful! Very roomy/comfortable condo, having a set of beach chairs and umbrella with the rental was great,less worry. Love the pool/hot tub combo.